The biggest tech festival of Europe is coming again! TNW Conference is more than just an ordinary event. 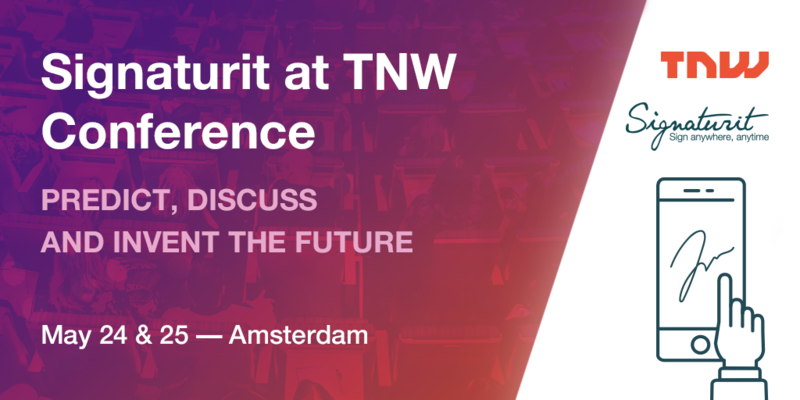 This year, TNW will take place on the 24th and 25th in Amsterdam, and Signaturit is also participating in this 13th edition! In this post we provide you with more information about the TNW conference and our participation. TNW - The Next Web - is Europe's main technology event that this year will take place for the 13th time already..
As mentioned in the aftermovie, the purpose of TNW is to move the world forward with technology. But it’s not the technology that’s going to change, it’s the people that are going to drive that change. That is why TNW wants to bring entrepreneurs, CEOs, marketers and developers together to make that possible. The reviews on former editions of TNW are praiseful. BBC News said: “This was a great show, the production was fit for tech superstars”. And VICE: “It was both terrifyingly interesting and interestingly terrifying”. These reviews show that TNW organizers are doing a great job in gathering the right people that will move the world forward with technology. Actually, they have already been awarded at the EuBea Festival in 2016 as the best European Event in the ‘Best Conference/Congress’ category. Who are the main speakers at TNW Conference 2018? A lot of interesting speakers have been invited to share their story, promising people from many different backgrounds. This year, some of them are mostly C-level leaders like Anjali Sud, CEO of Vimeo (the online video platform) and Daniel Gebler, CTO of the promising Dutch start-up Picnic, that is growing as online supermarket. But also comedians, writers and many more inspiring people are invited to talk. 20 Tracks of Content → 20 different tracks of conferences and talks in areas like creativity, marketing, blockchain and many more. Round-table Sessions & Workshops → Small-group sessions hosted by big speakers. In previous editions, some of the top sessions were hosted by the founder of Foursquare and the CEO of Product Hunt. Side Events & Parties → Networking drinks, dinners, boat rides, before- during- and after-parties, and much more. Food Trucks & Entertainment → Each year more than 20 of Holland's kitchens are invited, and there is entertainment like live music, arcade games and wellness sessions. Matchmaking & Networking → Over 3,800 meetings were booked last year thanks to TNW platform, and almost 100,000 messages were sent using their networking application. Signaturit → This year we are participating again with a stand where we will attend anyone interested in knowing how our electronic trust services can be useful to streamline processes and speed up operations in any company. Next to that, we are happy to tell you that we will be pitching as well! We have the opportunity to pitch in the Boardroom track for SaaS & Enterprise Technologies, which will take place between 13.45 - 15.15 at Friday the 25th of May. In this pitch, we will explain our services in 3 minutes, followed by 3 more minutes of Q&A with us. If you are attending the event as well and you want to know how our electronic trust services can contribute to streamline processes and speed up operations of your company, we will be happy to meet you there!